The UC San Diego Writing Hub offers academic support during the school year for undergraduates who are working on papers for any of their classes, including MCWP 40, 50, and 125. One-on-one assistance is provided by peer mentors who can help at any stage of the writing process -- from brainstorming for ideas to polishing a final draft -- and who can work with a range of issues such as essay development, clarity, organization, argumentation, citation, and revision. 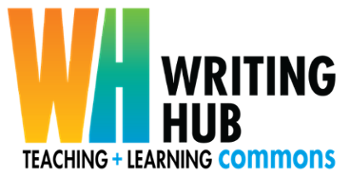 The Writing Hub is open for individual consultation sessions from the second week through the tenth week of fall, winter, and spring quarters. Appointments are available Monday-Thursday 9:00 a.m. - 8:00 p.m., Friday 9:00 a.m. - 6:00 p.m. and Sunday 4:00 p.m. - 8:00 p.m. Appointments can be made online at the Writing Hub's Website. Drop-in hours (first come, first served – as time permits) are available every Monday-Thursday 5:00 p.m. - 7:00 p.m.
Group workshops conducted by the Writing Hub offer strategies for success with a variety of key writing topics. All Writing Hub services are free of charge for UC San Diego students.